W. A. Criswell Sermon Library | Is This Man Jesus Also God? For He said, “I am the Son of God” [John 10:36]. He said, “He that hath seen Me hath seen God the Father” [John 14:9]. He said, “Before Abraham was, I Am” [John 8:58]. The great, almighty, omnipotent, “I Am” [Exodus 3:14], He said. There are three possibilities as we face such an incredulous and incredible claim; three of them. Number one: Jesus said He was God, but He knew He was not. He is a charlatan. He is a purposive and knowledgeable deceiver. He is a stated liar. That’s one possibility. The second possibility: Jesus said He is God, but He was self-deceived. He was mentally aberrated. He was insane, abnormal, was mentally disordered. The third possibility: He never said He was God. The disciples placed those words in His mouth, and they are the charlatans and the deceivers. Let’s look at those for a minute, the three possibilities. First: He said He was God, but He knew He was not God. He was a purposive deceiver. He was a charlatan. He was a liar. Even the most fanatical and bitter enemies of the Lord, unbelievers, have rarely pressed a conclusion like that, that the Lord was a conscious liar and deceiver, an imposter and charlatan. And the reason for it is very apparent. We have here in the Bible what the Lord taught, extensive page after page of His teachings. And they don’t sound like the teachings of a liar and a charlatan and a deceiver. It would be hard to conclude that the incomparable, ethical, moral, spiritual teachings of Jesus were based upon a lie. And the second facet of that is no less unthinkable. It is difficult to persuade one’s self that the beautiful, perfect, sinless, noble, virtuous character of our Lord is that of an imposter. He’s a deceiver. I am trying to prevent anyone from saying the really silly thing that people often say about Jesus. Namely, ‘I’m ready to accept Jesus as a great moral teacher, but I do not accept His claim to be God.’ That’s the one thing you cannot say. A man who was merely a man and said that sort of thing that Jesus said would not be a great moral teacher. He’d either be a lunatic on a level with a man who says he’s a poached egg, or else he’ll be the devil of hell. You must make your choice. Either this man was and is the Son of God, or else a madman or something worse. You can shut Him up for a fool, you can spit at Him and kill Him for a demon, or you can fall at His feet and call Him Lord and God; but don’t let us come with any patronizing nonsense about His being a great human teacher. He hasn’t left that open to us. It is unthinkable and unimaginable that the beautiful, holy, noble life of our Lord is that of an imposter, a charlatan, and a deceiver. The second possibility; the first one, Jesus said He was God, but He knew He wasn’t. He is an imposter. The second possibility: Jesus said He was God, but He was mentally aberrated. He was self-deceived. This would provoke a discussion on our part of Jesus as a psychotic, as a paranoia, as a megalomaniac with delusions of grandeur; He is God. Well, we have His life spread here before us in minutest detail. And we have His words page after page of them. Read them. Do they sound to you, when you read these profound words of the Lord Jesus, do they sound to you as the words of a man who is mentally disordered, who’s paranoid, who’s psychotic, who’s lunatic? Do they sound like that to you? If you were to take the sum total of all authoritative articles ever written by the most gifted and qualified of psychologists and psychiatrists on the subject of mental hygiene; if you were to combine them and refine them and clean out the excess verbiage, and if you were to have these unadulterated bits of pure scientific knowledge concisely expressed by the most capable of living poets, you would have an awkward and incomplete summation of the Sermon on the Mount, and it would suffer immeasurably through comparison. For nearly two thousand years, the Christian world has been holding in its hands the complete answer to its restless and fruitless yearnings. Here rests, in the Sermon on the Mount, the words of Jesus, the blueprint for successful human life with optimum mental health and contentment. That from a psychiatrist. Does it sound to you, when you read the words of the Lord Jesus, that they are the words of a man who is mentally disordered? He is a lunatic? They don’t to me, and they don’t to you, and they don’t to any right-thinking person. “Never a man spake like that Man” [John 7:46]. The third possibility—the first one, He said He was God, but He knew He was not; He was a deceiver, an imposter. The second possibility, He said He was God, but He was self-deceived, He was mentally aberrated, He was insane. The third possibility: He never said He was God; it was the disciples who put those words in His mouth. They deified Him. Well, let’s honestly look at the possibility of the disciples deifying the Lord; they made a God out of Him. Number one: there never was anyone who ever lived who was a poorer candidate for deification than Jesus. I can well imagine the Greeks deifying Alexander the Great, the creator of the great Hellenistic empire. And they did. I can understand how they did. I can understand how the Romans deified Augustus Caesar. He had the entire civilized world in his iron hand. And I can understand how they bowed down before Augustus Caesar. 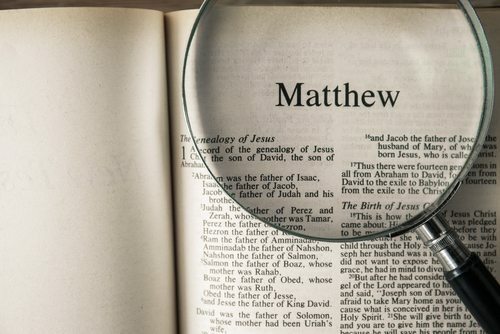 But not in ten thousand lifetimes could I ever understand how the monotheistic Jews could ever deify a poor carpenter from Nazareth [Mark 6:3], and one that was crucified as being a felon [Matthew 27:38-50]. It doesn’t make sense. He was the poorest candidate for deification imaginable. Number two: in every cardinal point, Jesus’ conception of Himself was diametrically opposite to the conception of all the Jewish people, including the disciples, concerning what the Messiah was like. Without exception, the Jewish nation, including the disciples, looked upon the Messiah as one who would bring in the kingdom, the messianic kingdom, and he would lead an army victoriously against the Roman slavery, masters, the men who had defeated them and ground them to powder, insulted them. You can’t imagine the hatred of the Jew who had the oracles of God for the pagan Rome who crushed him. A few years after the life of our Lord in 66 AD, they mounted that awesome revolt against Rome that ended in the destruction of the nation in 70 AD. Without exception, the disciples and the Jewish nation were looking for a Messiah to lead them into heights of glory, a kingdom that was material, filled with grandeur and glory. The Lord Jesus said, “My kingdom is not of this world” [John 18:36]. His idea of a suffering Messiah, they had never thought of, and it was unthinkable to them. And that He should be crucified and die, the Messiah? They never thought for it. The idea, I’m saying, of our Lord, of His own ministry, His conception of the messianic ministry, was diametrically opposite to that of the Jews, including all the disciples. Third: I’m talking about the disciples putting in the mouth of Jesus deity, making a God out of Him. Third: the disciples of our Lord were ethically and religiously and morally and psychologically incapable of performing such a miracle of deification. They couldn’t do it. It was they who had to be convinced. Simon Peter said, “I do not even know Him. I never heard of Him. I do not even know Him” [Matthew 26:69-74]. John took His mother—took Jesus’ mother, Mary, home, to care for her the rest of his life [John 19:26-27]. It was all over. It was done. Every dream had been crushed in the dust of the ground. To John, it was over. The great Saul of Tarsus who became Paul the apostle, said, “I am the least of the saints because I persecuted the church of God [1 Corinthians 15:9]. And when they were put to death, I cast my vote against them” [Acts 26:10]. The men who had to be convinced of our Lord were the disciples themselves. Nor could they have invented the life of our Lord. No man can. No man is capable of it. Nor is it psychologically possible that they manufactured the story of the resurrection, and knowing that it was a lie, they laid down their lives for it. Psychologically, that is impossible. One possibility: Jesus said He was God, but He knew He wasn’t—He is an imposter. Second possibility: Jesus said He was God, but He was self-deceived. He was mentally aberrated. Third possibility: He never said He was God; the disciples placed those words in His mouth. That is psychologically, religiously impossible. Then there must be a fourth. What was it that changed those followers of the Lord, shattered and broken, into flaming evangelists that converted the Roman Empire, did away with all the gods of the Greeks and Romans? I don’t know anybody in the world that bows before them today. At that time, the whole world bowed before them. And won the entire civilized world to Christ. What happened to those men that transformed them from broken, shattered bands of defeated followers into flaming martyrs for Christ? It must be a fourth possibility. Jesus is what He said He was, the Son of God! [John 10:36]. That is the witness of the primary documents. When you go back and back and back to the beginning, this is the universal testimony of the prophets and of the apostles. The prophets, “A virgin shall conceive, and bear a Son, and call His name Immanuel, God is with us…” [Isaiah 7:14; Matthew 1:23]. From the beginning, in that first Christian century, Jesus was worshipped as God. It’s a strange thing to me. I’m just saying my reaction to it. It’s a strange thing to me in my study of Christian history, that the first heresy that the church first faced was Docetic Gnosticism, Docetic, the Docetics. There’s a Greek word dokeō which means to seem to appear; Docetic from dokeō, to seem to appear, and Gnostic means someone who prided himself in his superior knowledge. Gnosis is the Greek word for knowledge. So Docetic Gnostics were men who proclaimed themselves as having superior wisdom and knowledge. Now in the first Christian century, the first heresy that the church faced was Docetic Gnosticism; namely, that Jesus just appeared to have a body. He just appeared to be human, but actually, He was God. So deep and profound and fundamental and dynamic was the impression of Jesus as being God, that the first heresy was, He is not man at all. His body just appeared, dokeō, just seemed to be human, but He was actually God. And the worship of Jesus as God in those beginning Christian centuries was the one tremendous characteristic of the Christian faith. In 112 AD, Pliny the Younger, who was the Roman governor of the Roman province of Bithynia, Pliny the Younger wrote a letter to Trajan, the Caesar, the Roman emperor at Rome. And what occasion the letter was, the temples of Bithynia were being emptied; nobody any longer worshipping the Greek gods, Roman gods, Jupiter, Mercury, Poseidon. The temples were empty. And Pliny the governor was writing to Trajan and to know what to do. Well, in the letter, Pliny explains why the Greek temples were empty. He says, “The Christians, the Christians have swept the province of Bithynia, and they gather on the first day of the week—that’s Sunday—and they gather on the first day of the week to sing hymns to Jesus as God.” That’s what Pliny wrote. The beginning of the Christian faith was that: Jesus is God! Now, that’s my introduction. We’re coming now to the sermon. I have four points in the sermon, if I can get them in before we go off the air. “I am the way, I am the truth” [John 14:6]. “I am the vine” [John 15:1, 5]. “I am the life” [John 14:6]. “Ask in My name” [John 14:13-14]. “I will rise from the dead” [John 2:19]. “Whoso eateth My flesh, and drinketh My blood, hath eternal life, and I will raise him up in the last day” [John 6:54]. “Keep My commandments” [John 14:15]. “I am from above” [John 8:23]. “I came down from heaven” [John 6:38]. “Before Abraham was, I Am” [John 8:58]. “All power is given unto Me in heaven and in earth” [Matthew 28:18]. “I am greater than the temple” [Matthew 12:6]. “A greater than Solomon is here” [Luke 11:31]. “I am the Lord of the Sabbath” [Mark 2:28]. “He that hath seen Me hath seen God the Father” [John 14:9]. “Come unto Me all ye that labor and are heavy laden, I will give you rest” [Matthew 11:28]. “You call Me Master and Lord; and you say well; for so I am” [John 13:13]. “Hereafter ye shall see the Son of Man sitting at the right hand of Power, and coming in the clouds of glory” [Matthew 26:64]. “Lo, I am with you alway, even until the end of the world” [Matthew 28:20]. “The Son of Man shall come . . . and then shall He reward every man according to his works” [Matthew 16:27]. Those are the words of God. And they’re blasphemous if they’re not from the lips of Him who is the great “I Am” [John 8:58]. Number [one], the words that He said are the words of God. David was the man after God’s own heart [1 Samuel 13:14; Acts 13:22]. And I come to David, and I say, “David, the king, are you the ideal sinless man?” And David replies, “When I had it in my heart to build the temple, God said, `No, you are a man of blood and of war’“ [1 Chronicles 22:8, 28:3]. Jesus said John the Baptist was the greatest man born of woman [Matthew 11:11]. I approach John the Baptist and ask him, “Are you the sinless and ideal man?” And he replies, “I am from beneath; He is from heaven [John 1:30]. And I am not worthy to loosen the latchet of His shoes” [John 1:27]. I approach the apostle Paul, and I ask him, “Are you the ideal man, the sinless and perfect man?” And Paul replies, “I am the least of His servants because I persecuted the church of God” [1 Corinthians 15:9]. Where shall I find that ideal life? It is impossible for mankind to create it. He cannot do it. Read Achilles in Homer’s Iliad, or Odysseus in his Odyssey. Is it Achilles? Is it Odysseus? Homer couldn’t create Him. Or Virgil’s Aeneas in his Aeneid: is it Aeneas? Virgil couldn’t create Him. The Agamemnon of Aeschylus: could Aeschylus create Him? Dante’s Beatrice: could Dante create such a holy and heavenly life? Could he? Shakespeare’s Hamlet: is it Hamlet? Victor Hugo’s Jean Valjean: is it Jean Valjean? Or Alfred, Lord Tennyson’s King Arthur of the Round Table: is it King Arthur? No man can create the holy, heavenly life of the Lord Jesus. He can’t do it. And even the enemies of our Lord said, as Pilate, “I find no fault in Him at all” [John 18:38]. And Judas said, “I have betrayed the innocent blood” [Matthew 27:4], that article is much there. Pilate’s wife said to her husband, “Have thou nothing to do with that just Man” [Matthew 27:19]. One of the malefactors crucified with Him said, “This Man hath done nothing amiss” [Luke 23:41]. And the centurion who presided over His execution said, “Truly, this Man is the Son of God” [Mark 15:39]. Our Lord is unique and separate and apart. There’s none like Him [1 Timothy 2:5]. · To the artist, He is the one altogether lovely [Song of Solomon 5:16]. · To the architect, He is the chief cornerstone [Acts 4:11]. · To the astronomer, He is the Sun of Righteousness [Malachi 4:2]. · To the baker, He is the living bread [John 6:35, 41, 48]. · To the banker, He is the riches of the world [Matthew 13:46]. · To the biologist, He is life itself [John 14:6]. · To the builder, He is the sure foundation [1Corinthians 3:11]. · To the doctor, He is the Great Physician [Matthew 12:15]. · To the educator, He is the Master Teacher [John 3:2]. · To the engineer, He is the true and living way [John 14:6; Hebrews 10:20]. · To the farmer, He is the sower and the Lord of the harvest [Matthew 9:38, 13:3-23]. · To the florist, He is the Rose of Sharon and the Lily of the Valley [Song of Solomon 2:1]. · To the geologist, He is the Rock of Ages [Isaiah 26:4]. · To the horticulturist, He is the true vine [Jude 15:5]. · To the judge, He is the righteous and judge of all men [2 Corinthians 5:10]. · To the juror, He is the faithful and true witness [Revelation 1:5]. · To the lawyer, He is the great Counselor and Advocate [1 John 2:1]. · To the newspaper man, He is the good tidings of great joy [Luke 2:10]. · To the philanthropist, He is the unspeakable gift [2 Corinthians 9:15]. · To the philosopher, He is the wisdom of God [1 Corinthians 1:30]. · To the preacher, He is the Word of the Lord [John 1:1]. · To the sculptor, He is the living Stone [1 Peter 2:4]. · To the servant, He is the good Master [Mark 10:17]. · To the statesman, He is the desire of all nations [Haggai 2:7]. · To the student, He is the incarnate truth [John 14:6]. · To the theologian, He is the author and the finisher of our faith [Hebrews 12:2]. · To the toiler, He is the One who gives us rest [Matthew 11:28]. · To the sinner, He is the Lamb of God that taketh away the sin of the world [John 1:29]. · And to the Christian, He is our Lord and our God [John 20:28]. There is none like Him nor is it possible for human genius to create Him. He is unique and apart [Hebrews 7:26]. He is our Lord God [Titus 2:13]. Number three, not only the words that He spoke were the words of God, not only what He was, the life that He lived is the life of God, number three: what He did only God could do. He could speak to the raging winds and waves. “Be still,” and they are quiet at His feet [Mark 4:37-39]. He would say to a paralytic, “Stand up,” and he that never walked stood up [John 5:8-9]. He would say to the leper, “Be thou clean,” and the leper was whole again [Matthew 8:3]. He could say to the dead, “Come forth,” and the dead lived again [John 11:43-44]. He said, “The third day I shall rise from the dead” [Matthew 20:19]. Romans 1:4 has in it a marvelous word, horizō. Our word horizon comes from it, where the demarcation lies between the earth and the sky, the horizon. It’s that word “declared,” it’s translated, horizō. Jesus is horizō, “declared,” pointed out, marked out to be the Son of God by the resurrection from the dead. I was amused at something I read in the life of Napoleon Bonaparte. A man came up to him and said he was starting a new religion, but he was having trouble getting people to believe in him. And Napoleon flippantly remarked, “Why, that would be easy. Just get yourself crucified, and the third day rise from the dead. Then they’ll believe in you.” What He did only God could do. Number four: not only what He said, only God could say; not only what He was, only God could be; third, not only what He did, only God could do; but fourth, and sweetest and most precious of all: the hope and the promise that He offers is the hope and the promise of God. In life, He is our friend and sojourner and fellow pilgrim and companion. Down any lonely road, He will walk with us. Facing any confrontation, He is there to help us. In any sorrow, He is strength and comfort. In life, He is our great Friend. The hope and the promise of God is in Him. Not only in life, but in death, the hope and promise we have in Christ is in God [2 Peter 1:10-11]. Don’t be afraid. That’s God; that’s our Lord. That is Jesus, our Savior. May we stand together? Dear Lord Jesus, it seems to me I ought to be on my face. I ought to be on my knees. Thou art so holy, high and lifted up. I feel like Simon Peter who bowed at Thy feet saying, “Lord depart from me. I am a sinful man. I am not worthy standing in Thy presence” [Luke 5:8]. I feel like the apostle Paul, “I am the least of the saints” [Ephesians 3:8]. How is it I could stand here in this pulpit and name the unspeakable name, the great I AM, Jesus? [John 8:58]. It’s just that when we fall at Thy feet as dead, You lay Your right hand upon us as You did the sainted apostle John and say, “Fear not, I have the keys of Hell and of Death” [Revelation 1:17-18]. And our Lord, if ever in our lives there was a time when we do confess Thee as Savior and King, it is now. Bless our people as with open hearts we lift up our souls to Thee. Lord, Lord, in adoration, in love, in thanksgiving for saving us, we praise Thee forever and ever. And while our people stand in the presence of God in prayer, and in a moment when our choir sings the appeal, a couple you, a family you, one somebody you, down one of these stairways if you’re in the balcony, down one of these aisles, if you’re on the lower floor, “Pastor, today I have decided for Christ, and here I come.” Do it now. Make the decision in your heart, do it now. And in this moment when we sing, make that first step. It will be the greatest step you ever made in your life. And angels will attend you the rest of the way, come. And thank Thee, Lord, for the sweet harvest; in Thy saving grace, amen. While we sing our song, while we make appeal.